This written and artistic content is copyrighted. Please contact the author for prints and content. A downloadable link to the project will be available soon. The StoryBook Art and Fable were designed to promote children's welfare. The project is available for nonprofit and educational display. 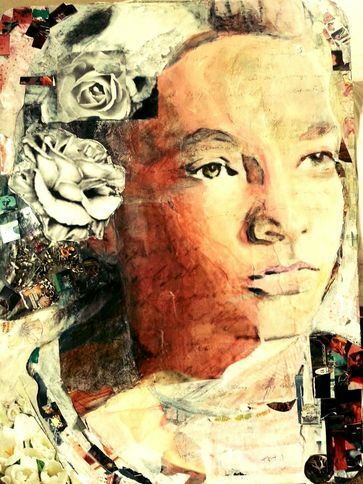 Prints of the work are available to the public on canvas and paper. The content and its art describe the healthy process of learning to understand feelings. Research shows at-risk children are less likely to be able to identify and name feelings, the first step toward emotional regulation. These skills are essential to learning, building healthy relationships with others, and developing a healthy self-image. The StoryBook Project describes the simple actions that anyone can take to help a child learn emotional regulation. Teach a child feeling names and listen to the child describe those feelings. The project coordinates with funders, professionals, educators and nonprofit organizations to support the goal of emotional literacy. 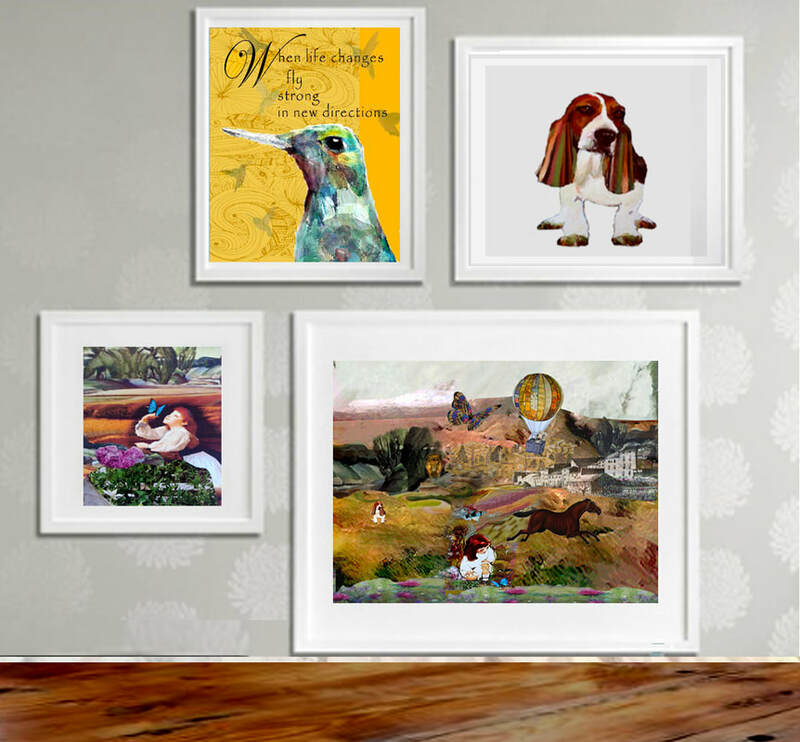 Selections from the work are available as originals, posters and prints. Allison is confused when adults tell her not to feel angry or afraid. She feels shaky inside sometimes. Allison asks Cookie the Cat why adults tell her confusing things about feelings. 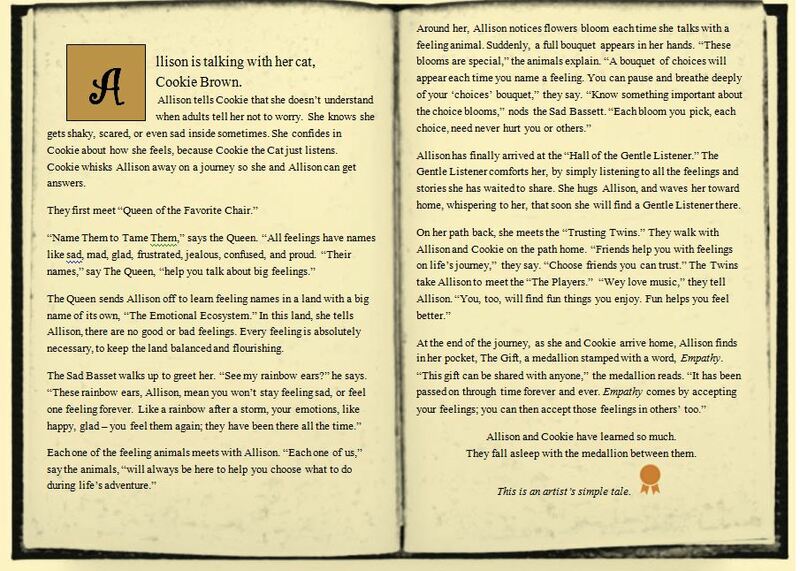 Cookie whisks Allison away on a magical feelings journey to find some answers! Allison meets the Queen of The Favorite Chair. The Queen tells Allison to venture into The Emotional Ecosystem to learn the secret of "name them to tame them." She will find wisdom there, says the Queen. The Emotional Ecosystem is a land filled with fantastic feeling creatures. Each one wants to meet Allison! The first to greet Allison is The Sad Basset. He shakes his rainbow ears and says, " Allison, all your feelings are normal and each one has a name. Feelings don't last. Like these rainbow ears, feelings come in many colors and can change like the weather. Even sadness comes and goes," he says. Allison noticed blooms all around her. And a full bouquet appears in her hands. "These are the choices blooms," say the animals with nods and smiles. "They are special. You have choices about the actions you take when you name a feeling. The choice you make need never hurt you are others." Allison meets The Gentle Listener who comforts her and listens to all the stories she has waited to tell. The Trusting Twins wind softly around Allison's legs with a purr. They tell her that friends help her on her emotional journey. "Choose friends you can trust," they say. The Players tell Allison that activities she enjoys will help her feel better. The Players like music-making. 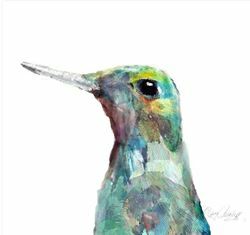 "Be open-minded and curious," says the Curious Hummingbird. "You will always have something to do, somewhere to go, something to learn! This helps no matter how you feel." The Gentle Lion of Courage tells Allison that courage does not exist without fear." Courage," he says, "is walking forward, with your heart beating a mighty fearful rhythm in your chest." His beautiful eyes are soft with age-old wisdom as he rests beneath the trees. Talking to our children about feelings isn't easy. 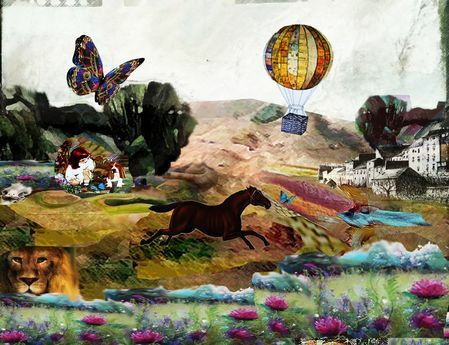 The StoryBook Project now consists of a number of tools; art, motivational posters, prints, and a fable. I hope to combine these resources into a book. Child development experts and neuroscientific research agree: Name Them to Tame Them. Helping a child name his feelings bolsters emotional stability and healthier relationships.